Wearing the right job interview outfits does not need to break the bank! Here we show you how you can find affordable and appropriate job interview clothing for any situation. Once you have done your homework before your interview and found out what the job interview dress code is you can start to consider the clothes you have in your wardrobe. Many candidates find this challenging if they have a limited working wardrobe and a small budget. But it really does not have to be a big problem if you plan ahead, get creative and put our interview clothing tips and advice to good use! You really cannot go wrong with a business suit - it can be dressed up or down depending on the dress code you want to follow. 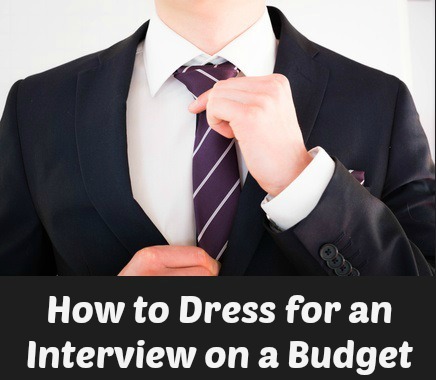 It is sure to make the right impression for both men and women job candidates and is considered the proper dress for job interviews in finance, accounting, banking, insurance, legal, sales, marketing and management. Where to find an affordable business suit? Shop at a national mass market retailer such as Target or discount stores like Ross and TK Maxx. Check out good, local second hand shops, charity shops or thrift shops for a business suit. In the United States major national thrift and charity shops include Arc Thrift Stores, St Vincent de Paul thrift stores and Savers or Value Village. In the United Kingdom visit Oxfam. In Australia, Vinnies is a good option. Have the suit dry cleaned and make sure there are no buttons missing or threads hanging loose. 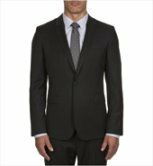 Buy a business suit on an online marketplace such as eBay - there are lots for sale and at reasonable prices. Black, navy and grey are classic colors that project a professional look. A single breasted, one or two button suit is a timeless style. "Watch for sales - Macy's really discount their suits"
"I used thrift stores like Goodwill and actually found some good items. Go to the ones in better neighborhoods where better quality stuff is given away"
"Consignment shops are a good option. Some even specialize in business wear. I used the directory lists at resaleshopping.com and consignmentshops.com to find shops in my area." "Check out outlets - Banana Republic has a particularly good outlet"
If the dress code is casual interview clothes you can purchase a smart jacket or blazer using these resources and match it with a pair of tailored pants or a skirt. A versatile blazer gives your dress an instant interview-ready look. What to wear with your business suit ? Purchase a plain white blouse for women or a white long-sleeve shirt if you are a man. This is a universal item of clothing that can be worn with most suits, jackets, skirts and pants and always looks smart. Add color with a tie or scarf. Inexpensive options for buying a smart white blouse or shirt include doing an online search to find shirts at wholesale prices or shopping at bargain department stores. Woman job candidates should purchase a pair of low to medium-heeled black pumps. These are always considered proper dress for job interviews. If you already own a pair make sure they are clean and polished. It is not a problem if they are a little old but it is a problem if they look un-cared for. The same applies to a pair of lace-up dark brown or black shoes for men. Female candidates can improve the impression they make by wearing pantyhose to a job interview. Choose sheer or neutral color hosiery to create a finished, polished look to your interview outfit. It is important to show that you have made an effort to find the proper dress for job interviews. Employers will not penalize you if your interview clothes are not expensive or new, as long as they fit you, are neat and tidy and you look professional. Proper dress for job interviews also means avoiding interview clothes that are too tight, too short or too low. Cover up tattoos. Research shows that people with tattoos and body piercings are perceived to be more likely to engage in high-risk and unhealthy behaviors. What should you not wear to a job interview? There are certain outfits, clothes and accessories that are considered inappropriate for job interviews and that can send the wrong message. Find out more about these interview dress mistakes that hiring managers complain about. Make a winning impression without spending a fortune!